Did you hear the rumor? Glee was awesome this week! Not only did we get lots of great storytelling involving lots of our favorite characters, we also received a number of little winks from the Glee writers to let us know they're aware of what's said out in the fandom. Think you missed something? Don't worry, we're covering all the moments that might have flown over you head, plus scoop on the remaining episodes. Just three more left! Wink, Wink. Nudge, Nudge: How awesome was it that the whole gang was sitting around spouting off all the couple names fans have given them over the past two years? But my favorite one was a couple name I haven't thought of yet: Noah Puckerman (Mark Salling) and Lauren Zizes (Ashley Fink) equal "Pisces." That is outstanding. Other points where the writers went all meta on us: Finn (Cory Monteith) talking about Quinn's (Dianna Agron) mood swings, the blind items, and Rachel's (Lea Michele) comment to him about his girlfriend: "I never understood why you got back with her." At which point, I bet all my Finchel fans shouted: "Neither can we!" Kristin Chenoweth Never Disappoints: I sincerely hope you all love April Rhodes as much as I do. Fast fact: My favorite Glee number ever is the "One Less Bell to Answer/A House Is Not a Home" mashup with April and Will (Matthew Morrison). Her voice is just gorgeous, and I was glad to see it showcased again. Plus, her presence planted that Broadway seed in Mr. Schuester's brain. Who else thinks that the trip to NYC is going to make that seed plant its roots a little deeper? Even Emma (Jayma Mays) wants him to go, and we all know she loves him more than she loves cleaning grapes. Which, we found out, she loves a little less now that she's on medication. Fondue for Two Forever, Please: Um, who else thinks Brittany (Heather Morris) should get her own web series spinoff? I want to see new episodes of Fondue for Two every single week. OK, I guess she might be too busy nursing her broken heart to interview Lord Tubbington anymore. I'm sorry, Brittana fans. This was a tough episode to get through. Since we all know Brittany's cat is reading her diary, we can only assume he's reading something like this: "The girl I'm in love with sang me the sweetest song about how she loves me, then went ahead and gave herself a new couple name: Santofsky. Oh, and my former boyfriend called me stupid and that made me cry. Plus, I think the orange crayon in my crayon box wants to steal my voice like the evil octopus witch in The Little Mermaid." What? Brittany thinks weird things. Bottom line: Times are tough for Brittany S. Pierce. Rachel, Quinn, and Finn Have Issues: Well, we've known these three characters be trippin' since pretty much the first episode of Glee. But this was the first episode in a while where everything was kind of laid out on the table, including Finn's trust issues. All that back and forth, and then back one more time led to Quinn giving Finn an ultimatum that can't lead anywhere good: If you sing with Rachel again, we're over. But at least Rachel could possibly find solace in Sam's (Chord Overstreet) arms? She did ask him to prom in the beginning of the episode, after all. The Rules of Reporting According to Brittany: Sue (Jane Lynch) bringing back The Muckraker was one of my favorite storylines in quite some time. It brought us legitimate tension between New Directions members, plus we got to see Brittany as a journalist. I don't know about you guys, but she gave me some great pointers on reporting. I'm taking the "ask inappropriate personal questions" tip and running with it. Next time I interview Ian Somerhalder, I'm asking him if he's a natural brunette. Sam Has a Secret: Turns out Sam's family has fallen into some very hard times. His dad lost his job, and now the entire family is living in a motel room. After keeping it from his fellow glee members for almost the entire episode, he finally came clean. 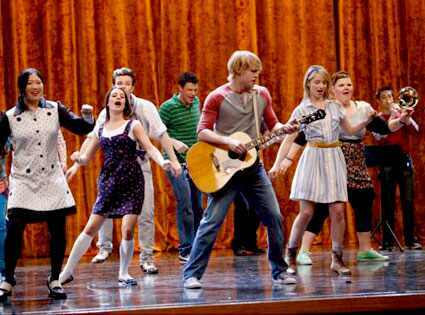 And so, New Directions wanted to make it right. 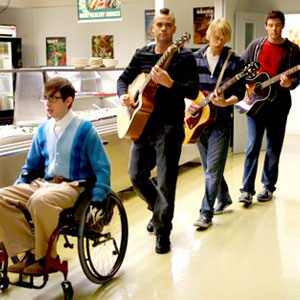 These are the moments I really love Glee. When the whole group of misfits stop bitching at each other long enough to actually help each other out. Oh, and Chord Overstreet's tears? It's like watching a shaggy puppy cry! It just ain't right! And then they bring in the little girl who tells her big brother not to cry? C'mon, Glee writers! I'm in a glass case of emotion right now and I can't get out! Enjoy my Anchorman reference seven years later. You're welcome. Rewind Moment: The entire scene with Jane Lynch in disguise while in the coffee shop. We missed you, Sue!